I just found the original manual and sales receipt for the RCA remote, as well as the receipt for the MC subwoofer cable. If anyone is interested....which it looks as though it's time to throw them back in a box I lowered the prices again as well. Doro...How would that sub cable work with my current system? I have a pretty crappy reciever. It's a DTS reciever, but would getting a new sub cable help me out? Just looking for an honest answer. I may be interested. Would you do 45 for the Remote? Demi - I think that a quality sub cable would be an improvement over a generic interconnect...but that's just my opinion. MC IMO has a prominent bass signature to their cables, but a muddy midrange and flat treble. That does not exactly translate into the M or Z series, as they are a much better IC than you would buy in BB or CC, but all of that is essentially useless as we are talking about a specific application. I would do $75 for both, hows that sound? If that's cool, email me your shipping addy and I will get them in the pipeline on Monday. Sounds like a good deal to me. I've been looking for an all in one remote and getting a better cable than I currently have at a nice price wouldn't hurt either. Also...do you accept PayPal? If so i'll get the money to you on Sunday night as i'm not on my home computer right now (girlfriends). Email on the way. Thank you. I was waiting for you to pick it up OR I'll deliver it on Saturday, whichever comes first. I'm not sure what Russman is proposing. Russman? Sheesh you guys are confusing me... just bring it down on Saturday. SONY ES TUNER IS STILL FOR SALE!! $50, and UPS shipping is included BTW. Just wondering if you got my Email Doro. I'll check mine when I get home. NM, I know you got it! Can't wait for the new remote! Another new toy. Check in the mail this morning! Just got the stuff at my office today! I'll give you a status report on the stuff when I get home. The only question I have is whether or not the screen is 'touch' sensitive. I noticed they have a little pen thing, but will using your finger work fine? If not it's a non issue, I can find something to use. GREAT SELLER! I'm very satisfied, and he even through in some free batteries! Thanks Mark. Just try and wipe the booger off your finger BEFORE using it. MUCH easier! It works great, thanks. You got my money, right? The Sony ES Tuner has been dropped to $35 including shipping anywhere in CONUS. Drop me a line if you are interested in these items prior to me getting pictures tonight. All the electronics have been cleaned with CAIG products, and tested for operation. I'll ship it tomorrow....and what you got laying around? Whadya want? Want an FM tube tuna? I'll just ship it and work out the details at a later date, no hurry here. 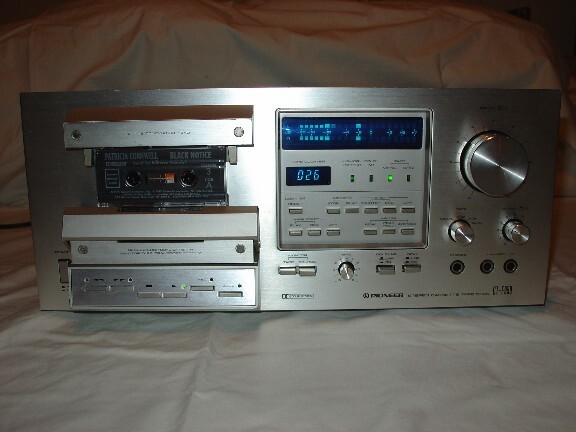 Pioneer CT-F950 Tape Deck (8/10) *SOLD* - This is a classic 1979 Pioneer, Silver Face, Rack Version....tape deck. I mean Rack Version as in this is "Rack Ready" provided you have "Ears". The standard version is insulted by a wooden case. 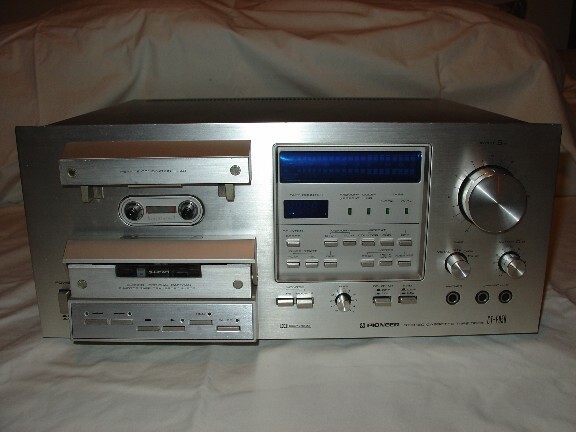 This is an old school tape deck, so don't expect autoreverse and high speed dubbing. It does however have some really neat features for recording, as that is the real purpose for rack mount gear IMO. This is one step above the entry line at that time for Pioneer. The TOTL being the CT-F1250 if I recall what I read correctly. I have completely cleaned the unit, and used CAIG De-Oxit and Goof Off for the stubborn spots. The rear RCA inputs/outputs are nice and shiny and coated in CAIG Pro-Gold Contact Cleaner and Enhancer. The only cassette tape I own is an audio book. I tested the deck out via this tape and it certainly works. No pitch issues or slow motors were experienced at that time. All the buttons function as labeled, aside from the recording/timer functions, which I could not test. The unit has a couple nicks on the transport area dress cover, and a small mark on the Input Volume Control. Price includes shipping anywhere in CONUS. The unit also has a DOA guarantee from me personally. If any problems are encountered, contact me immediately and we will get it resolved immediately. I have no manual or box for this unit, but I am an expert at packaging gear. No worries. Thanks for looking, I'll keep this here for a couple days then it's off to other places until gone. 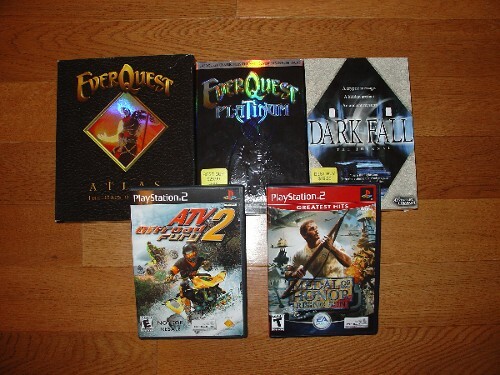 Everquest Platinum(PC) w/ Everquest Atlas(Maps of Myrist) 9/10 - $15 - No explanation needed. The Atlas is opened but was never used, not even a page turned. Darkfall(PC) 9/10 - *SOLD* - Great graphics, along the lines of Myst. This game will make your brain hurt. ATV OFFroad Fury(PS2) 9/10 - *SOLD* - This came with the PS2, so I can't in good conscience sell it. Just pass it along FREE when you have played it thoroughly. Medal Of Honor - Rising Sun(PS2) 9/10 - *SOLD* - FPS game that continues the MOH series. It's real cool, but I cannot for the life of me get used to the PS2 interface for these type games. I'm sticking to the PC. All prices are INCLUDING shipping, and as far as I know fair. If something is out of line, simply drop me a note. Thanks for looking. 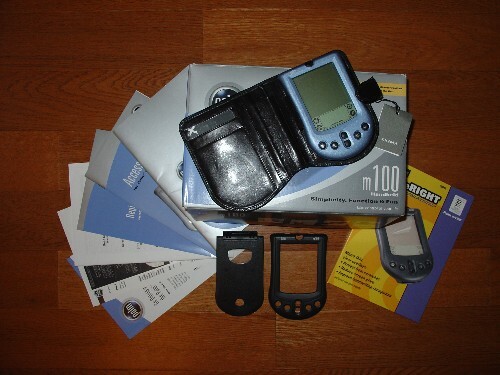 PALM Pilot M100 Handheld 9/10 - *SOLD* - Basic Palm handheld that was used by my wife until her birthday. It's in great shape and comes with alot of extra stuff. She used it all the time for work, and even though it is something like 2Mb, it always had enough space for her stuff. This would be something inexpensive for the kids or as a starter handheld for you or your spouse. It is updated from Palm and here is a link to some information. Original Manual/ Warranty Card/ Accesories Book/ Etc. No problem, email me your address again. I'll ship it tomorrow, send the payment when you get a chance. I will PM my addy to you if you don't have it already. EDIT: Actually, make that Tuesday....the fruit bat has the USB cable at work.